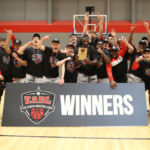 England Under-18s were crowned 2013 Haris Memorial Tournament champions after defeating Manchester Magic, 58-47, in the final on Sunday afternoon at the Amaechi Basketball Centre. Josh Steel was named MVP, leading all scorers with 17 points, 10 of which came in the fourth quarter as he held off the Manchester surge, along with 8 rebounds, 3 assists, and 5 steals. Deane Williams, who was impressive throughout the final, finishing with 14 points and 12 rebounds, hit a basket at the end of the opening quarter to give England the lead that they would not give up for the remainder of the game, despite multiple Magic rallies. Steel (pictured, right) took over in the final period to seal the title, adding 4 rebounds, 3 steals and an assist over the 10 minutes. “He’s a multi-talented young man,” said Brown of Steel. “He’s a ’97 and he just does everything. He handles the ball, he’s a leader on the floor, plays great defence; is long, and he attacks the rim and can hit the jumpshot. Overrall, Brown is feeling good about the England u18 squad that is being assembled for next summer. Dwayne Lautier Ogunleye, who along with Deane Williams was named to the All-Tournament team, added 8 points. Manchester were led by 14 points, 6 rebounds, 3 assists and 4 steals from their All Tournament team member, Pharroh Gordon. Left to right: Damia Paez (CB Cornella, Keno Pape (Akademie Weser), Pharroh Gordon (Manchester Magic), Deane Williams (England, Dwayne Lautier-Ogunleye (England). England Under-18 responded well to an early challenge from Cornella, coming out 68-54 victors to book their place in the final. Cornella jumped out to a 6-0 lead, but England responded with a 23-4 run of their own and held the lead for the remainder of the game. 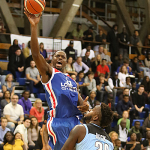 Joe Junior Mvuezolo led England with an 18 point, 13 rebound double double, with Dwayne Lautier-Ogunleye the only other player in double figures with 14. Marti Sanchez had 13 for Cornella, as they dropped into the third place playoff. In the game of the tournament, Manchester Magic came back from 14 points down with just over 6 and a half minutes remaining to beat Akademie Weser, 70-58. 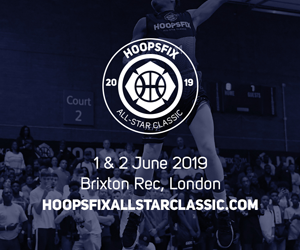 Magic looked dead in the water as Ponfick hit a shot to give the German team a 55-41 lead with 6:33 remaining, but Pharroh Gordon took over, scoring 16 points over the remainder of the game to send the home crowd into a frenzy and book his team’s place in the final. 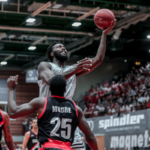 Gordon finished with 23 points to lead Magic, whilst Erwin Nkemazon had 15 to lead Weser. Akademi Weser secured third place in the tournament, with a 77-62 win over Spaniards, CB Cornella. 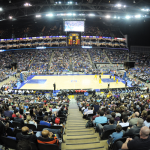 Leonard Ponfick had 13 points to lead the German side, whilst Keno Pape added 11 points and 15 rebounds. Cornella were led by 14 points, 9 rebounds and 3 assists from Damia Paez. England Under-17s wrapped up fifth place as they cruised past Sligo, 69-45. Kyle Carey had 16 points for the English, with Alex Roberts, Denzel Ubiaro and Brad Wood adding 11 each. Korolis Gunka had 22 to lead Sligo. 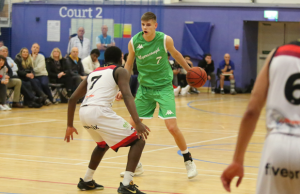 Manchester Magic Under-16s finished seventh after beating Zurich, 100-62. The team from Switzerland were held winless throughout the tournament, as Manchester’s two wins came against them. Moses Silweya had 25 points on 10/13 shooting to lead Magic, whilst Zurich were led by Jan Sedlacek’s 22 point, 13 rebound double double. 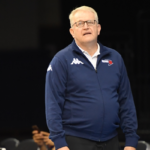 England Under-17s had little trouble dispatching of Zurich, winning 114-31. Kyle Carey and Alex Roberts had 22 points each to lead England, who had 35 steals, as Zurich turned the ball over 44 times. David Jezerkic had 8 points to lead Zurich. 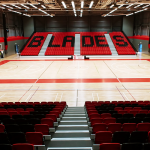 Sligo All-Stars came away with a 65-56 win over Manchester Magic Under-16s. 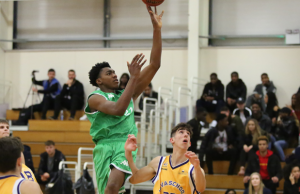 Cian Lally had 21 points and 15 rebounds to lead the Irish side, with Manchester being led by Ayo Nuwe’s 13. Karl Brown said after the game that next lot of cuts for U18s won’t be made until Easter time (cuts were made after their initial camp, but haven’t been announced). The players next meet at a skills camp in February. Brown, who has been an assistant for 5 years with the England programme, added the transition to Head Coach is difficult but going well, with a lot still to learn but is “up for the challenge”. 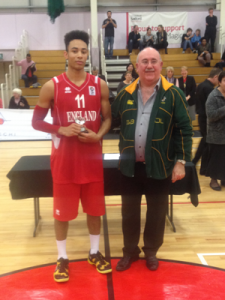 England U17s’ Kyle Carey finished as the tournament leading scorer, at 15.2ppg, Steel was in second at 14ppg, shooting 59% from the field. View stats leaders from the tournament here, but note it’s split in two for the group stages and finals; see an individual’s career stats for their full tournament statistics. More video footage from the tournament coming over the next week or so. 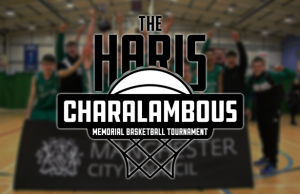 Huge thanks to Joe Forber, Mike Whelan, Richard Hill and the Manchester Magic programme for their hospitality over the course of the tournament. Thoughts? 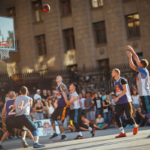 Did you make it to the tournament? 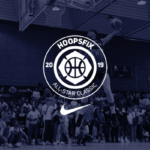 ← Previous Story Joe Junior Mvuezolo Dunks All Over Zurich at Haris! 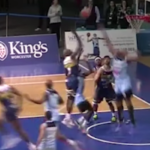 Next Story → Josh Steel Cradles the Dunk on the Break at Haris!